Last month I demoed some wreath projects for Lowes at the Casa Latina Home Expo. They asked me to recreate some projects they had on their site and give a live tutorial to the crowd. This is why I love being a craft designer. If I hadn’t of been given this assignment, I never would have made this wreath! 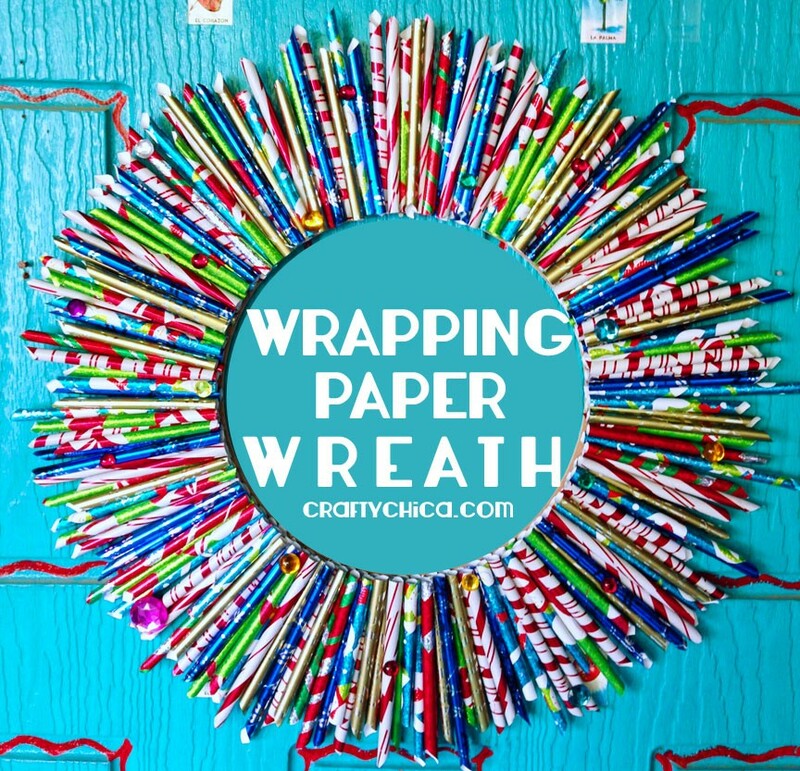 Sure, I’ve done my fair share of rolled paper crafts, but I’m really not a wreath kind of chica. I chose the Wrapping Paper Wreath and the Coffee Filter Wreath (coming here soon). I’m normally not a wreath person, but gosh, these were super easy and really fun to make. 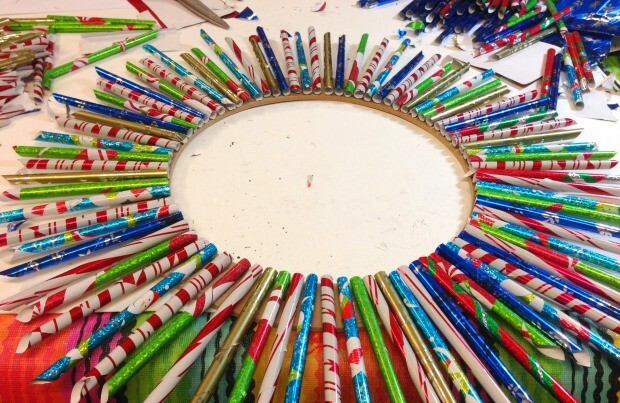 This wreath is the best type of craft to make while you’re watching holiday TV movies, it’s super festive! Here’s how to make it! Cut your paper into 4×4″ squares. It’s ok if they aren’t perfect, it will give more texture to the finished look. I’d say you need about 100 or so pieces. Take one piece and at the diagonal corner, roll it around the pencil. 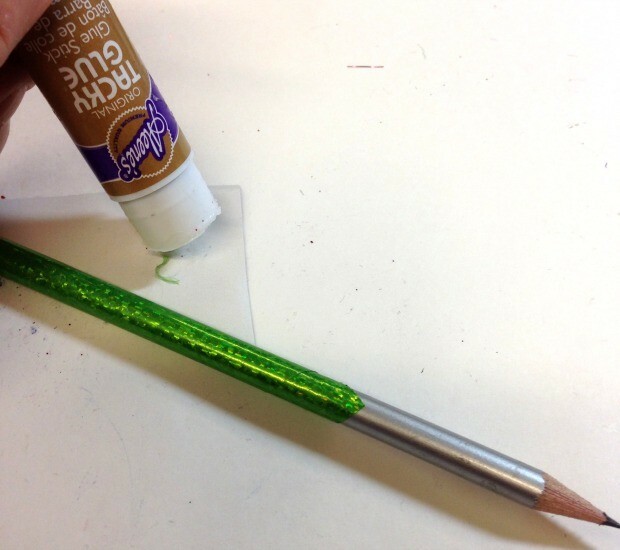 Add a generous amount of glue stick to the corner to seal the end down. Slide it off the pencil. Sort them by color. Next, pick up a handful, tap them so they are even and cut off the ends so one side is flat and the other is spiky. 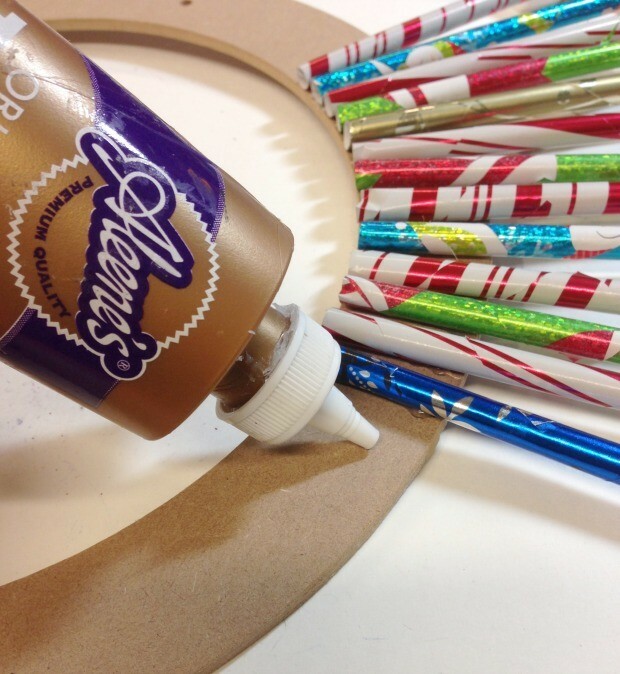 Apply a generous amount of Tacky Glue to the base, one section at a time. Set the rolls on the glue. I like using Tacky Glue instead of hot glue because it gives me time to move them around to be more even. Space them evenly and keep going all the way around. Here I have one layer finished. Let this dry and then add a second layer of rolls in between each of the first layer so it hides the base. If you want, you can cut the pieces shorter for the second row. Here it is with two layers of rolls and I added gems here and there to give it a bit of sparkle! There are a lot of versions out there on rolled paper wreaths, this is my spin, I hope you like it! 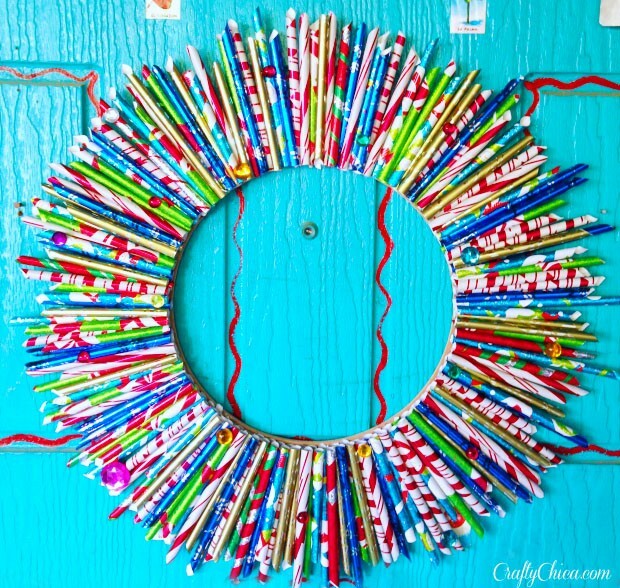 Also, you can use this in different ways – add a mirror to the back, or screen to make it an earring holder, it can be a centerpiece for a table, or you can add glass to make it a picture frame! 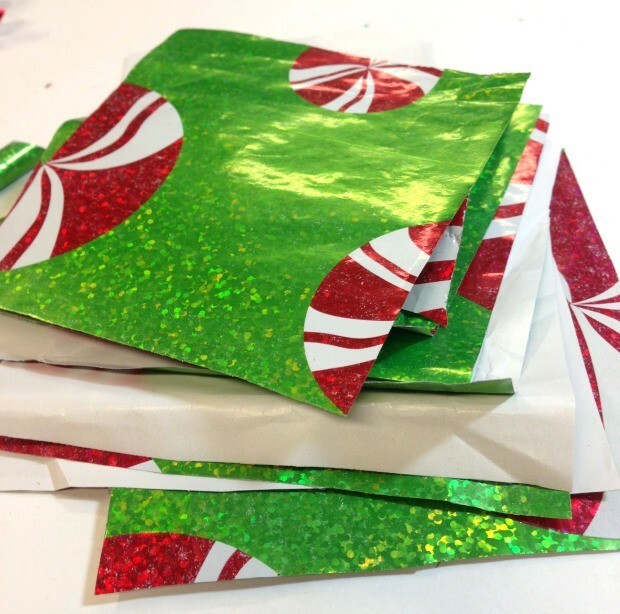 Another idea – I used assorted papers, but you could use all gold or just green and red, each one will give off a different look! NOTE: I think next time I’ll paint the base before I add the paper rolls, right? I really like this one. 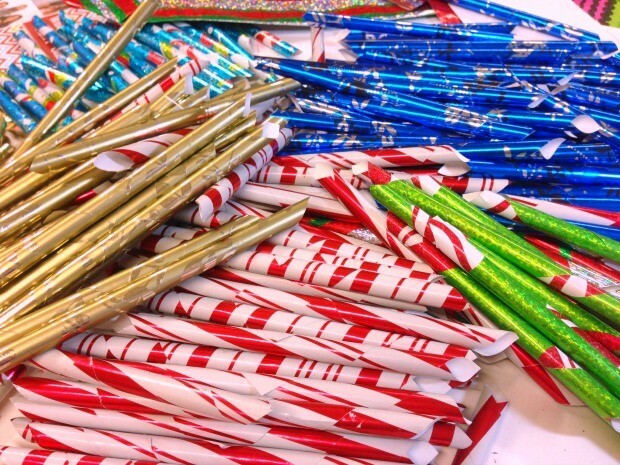 I love the idea of not tossing all the wrapping paper snibbles. It never felt good to just toss them. 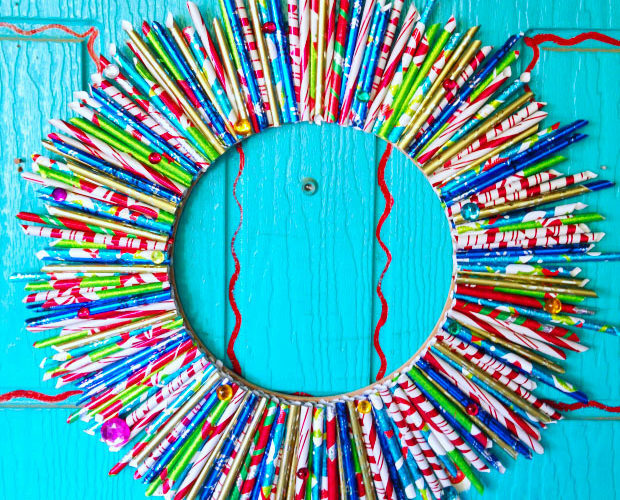 I tried making this wreath, but I used my stash of foil coffee bags instead of wrapping paper. And I tried a wire wreath form and rubber bands instead of glue. My mistake!